Twelve people were displaced when their McCabe Avenue rooming house was seriously damaged in a fire Sunday, March 29 in Bradley Beach. 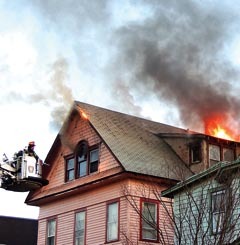 The fire at 217 McCabe Ave. began in the attic of the three-story wooden building, said Police Chief Len Guida. He said the afternoon-evening fire is considered non-suspicious and is believed to have been electrical in nature. There were no injuries, but two people were transported to the hospital, apparently for existing needs, Guida said. Guida said the building is at least temporarily uninhabitable. He said the American Red Cross provided temporary housing. Responding to the fire were police, firefighters, first aiders and the Office of Emergency Management from Bradley Beach, along with firefighters from the Avon, Neptune City, Neptune, Ocean Grove and Wayside (Tinton Falls) fire companies, according to Guida.